This is a quaint, small restaurant i San Francisco. 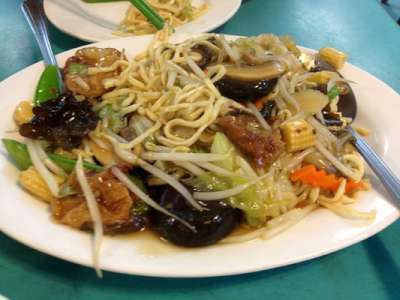 The service was consistently friendly and the menu is large with a number of mock meat and vegan Chinese dishes. They even have unusual mock meats like mock goose. I loved my diced chicken curry, which was light, fresh and filling. I think their food was excellent. Prices are extremely low (under $7-8 for most dishes), but you have to pay $0.70 for each small cup of rice, so it adds up to much more. I was disappointed that they didn't have brown rice. Still, this is a nice joint to get a simple, fresh, tasty vegan Chinese meal. Let us know what you think about this awesome vegan friendly restaurant: Lucky Creation Vegetarian Restaurant in San Francisco, California.